When completed La Sagrada Familia will have 18 towers of varying heights. There will be one tower for each of the twelve Apostles, each of the four Evangelists and one for the Virgin Mary. The tallest tower will be in the center and be dedicated to Jesus Christ. Upon its completion, La Sagrda Familia will be the tallest religious structure in the world. The church will have three facades. The Nativity Facade, the only one near completion when Gaudi died is dedicated to the birth of Jesus. Statues of birds, plants and animals salute the joy of life. The Passion Facade has a much different tone. The angular statues on this wall are late 20th century by Josep Subriarchs. It is a stark presentation with an elongated statue of Christ suffering on the Cross over the main door. Begun in 2002, the Glory Facade will be the principal facade of the church. It will depict the road to God through death, final judgment and on to glory. When I first visited La Sagrda Familia in 1976, there was no interior to speak of. You could look down from those towers that had been completed to see construction vehicles parked where the interior would be. 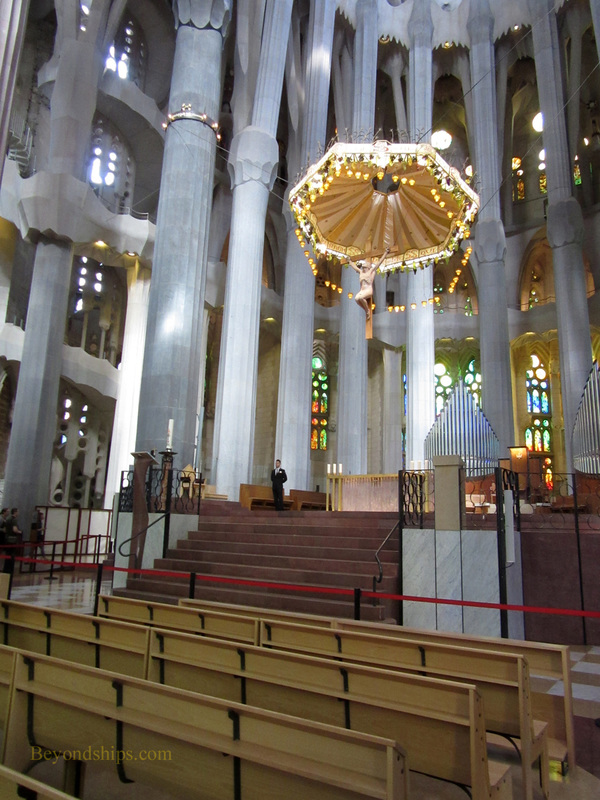 Today, the interior has been enclosed and La Sagrada Familia is a functioning place of worship. The interior is laid out in the shape of a Latin Cross. Tall, lean pillars of various colors soar upwards. However, their shape is organic giving the feeling that you are in a forest. The windows have been placed so that the light is broken by the branches. It is a serene atmosphere despite the throngs of visitors milling around. 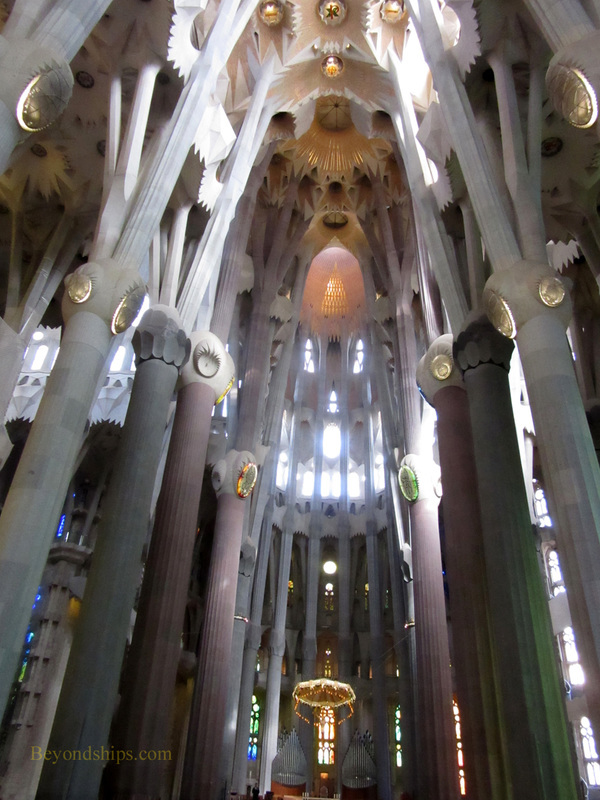 In addition to the church itself, visitors can view exhibits and workshops underneath the church in the Museu Gaudi. There is also a small building in the shadow of the church that was built by Gaudi as a school for the children of the people working on the project. It contains a re-creation of Gaudi's office as well as a schoolroom. The fees to enter La Sagrada Familia go towards funding the continuing construction. You can take a tour with a guide, use an audio tour player, or just walk around on your own. There is an extra charge to go up into the towers, which is worthwhile but not for the fainthearted or those with medical conditions. Some three million people visit La Sagrada Familia each year. There is a ticket booth outside of the Passion Facade. However, it is a better idea to purchase tickets online beforehand. The crowds are daunting but this is an experience that is out of the ordinary. Above: The words of the Lord's Prayer in Catalan appear on the door to the main entrance. 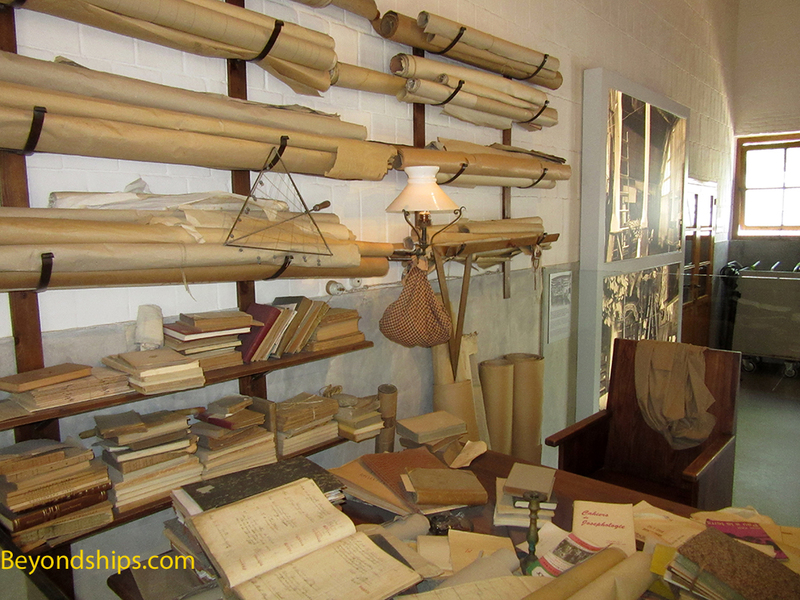 Below: A re-creation of Gaudi's office.